City of Tacoma » Government » City Departments and Offices » Environmental Services » Urban Forestry - Evergreen Tacoma » What is Right-of-Way? The public right-of-way is typically an easement over the land of the abutting property owner. According to our TMC 8.30.020, public right-of-way includes the area of land, the right to possession of which is secured by the City for right-of-way purposes and includes the traveled portion of the public streets and alleys, as well as the border area, which includes, but is not limited to, any sidewalks, planting strips, traffic circles, or medians. 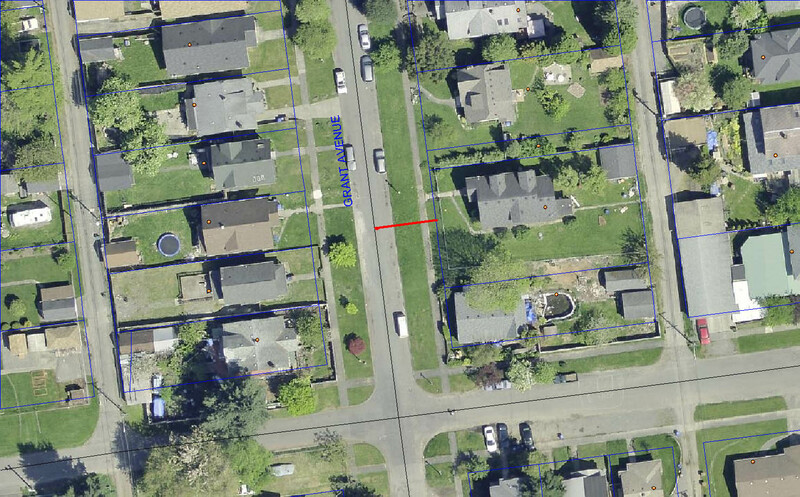 The City of Tacoma requires abutting property owners to maintain adjoining rights-of-way. This includes streets and alleys extending from the owner's property lines out to the curbs or edges of pavement (includes sidewalks and planting strips) if improved, or if unimproved (unpaved), out to the centerlines. There are several places in the Tacoma Municipal Code where these obligations are stated: Chapters 9.17, 9.18, 8.30, 8.31, and 12.09.